We want to provide actors with easy access to relevant and updated information and inspire them to keep acting. We believe the future is art. Having positive, engaged and well-informed actors is essential to develop and support growth in the creative industry. Since establishing in 2005, we never follow the crowd, always pushing boundaries towards our objectives. We have created productions such as Today and Tomorrow, The 2b Show, Witch Trinity, Comedy Monologues and Fringe Theatre plays which have all provided paid work to many actors over the years. We are planning future ongoing interactive productions to offer continues opportunities so even more actors can be acting. Our previous collaborations with organisations such as the Arts Council England, The Joseph Rowntree Charitable Trust, ITV local, Venus TV and Leeds City College, to name just a few, and the creatives we continuously engage with, has given us the knowledge and ability to establish this must have resource to help actors in their career. Exercises to improve your acting skills * Information and news to improve your knowledge about the acting industry and inspire you. Update on changes in technology that may impact your work * Improve your opportunities with tips, advice and examples. It encourages you to engage and share with other actors * Provides you with growing acting resource to help you find and keep working. The magazine is a place to voice your opinion, offer advice to other actors and be part of a community that can help you in your career. It is also an opportunity to stay in touch or work with 2b Acting. In this issue our feature articles are; THE QUALITIES OF HOLLYWOOD ACTORS: What makes these actors stand out, CHALLENGES FOREIGN ACTORS FACE IN THE UK: What needs to change to improve diversity, HOW TO GET YOURSELF NOTICED AS AN ACTOR: Useful tips to help your career, GET MOTIVATED AND STAY MOTIVATED: How you approach the working day can make all the difference, THE GREAT EASTER MOVIE HUNT: A great way to spend time this Easter. Useful resources such as ACTING EXERCISES, ACTING TECHNIQUES, CV SAMPLE, LEGAL STUFF and more. In this issue our feature articles are JOBS FOR ACTORS AT CHRISTMAS - Pointers to seasonal acting roles, HOW TO CHOOSE A MONOLOGUE FOR AN AUDITION? – The right Monologue may help land the role, HOW TO SET GOALS FOR THE NEW YEAR! – Planning is essential, PREPARING FOR AN AUDITION – What to do to be ready when the casting call arrives, CHRISTMAS GIFTS FOR ACTORS – Some help with gift giving. Actors deserve some thought. In this issue our feature articles are THE SILENCE IS BROKEN - The impact of Weinstein and Bill Cosby, WHY ACTORS FAIL AUDITIONS - 70% of actors fail to turn up to auditions, SELF EMPLOYED OR EMPLOYED? - What does this mean for an actor?, MAKE YOUR LUCK - Your acting career can really be what you make it, WORK FOR FREE – Why would professional actors do it? 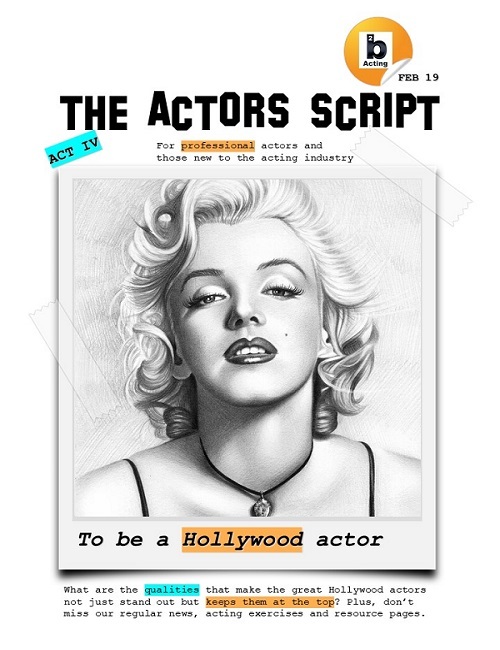 In this issue, featured articles are: IS ACTING A REAL CAREER? - the struggles actors face, DIVERSITY IN ACTING – Is there a problem?, SOCIAL MEDIA CASTING – good or bad?, EXTRA WORK – some do’s & don’t, ACTING MAKEUP – essentials. Also included is our featured Interview where we talk with Jo Parker, casting director and founder of NDAS plus Acting News - Stories on New Hearing Aids for hearing impaired actors, Actors working for no pay and the impact of social media on acting careers.